This month’s article for The Bath Magazine was all about retro geometric prints. Today I’m sharing a condensed version of that article. To read the full thing, pick up a copy of The Bath Magazine or find it online here. Wallpaper is one of the most direct ways you can decorate with pattern. Since it burst back onto the interiors scene a few years ago, wallpaper design has flourished. There are now thousands of prints and patterns to choose from, including plenty of retro geometric designs. But what I think is most exciting about wallpaper is that, despite its name, it’s not restricted to the walls. 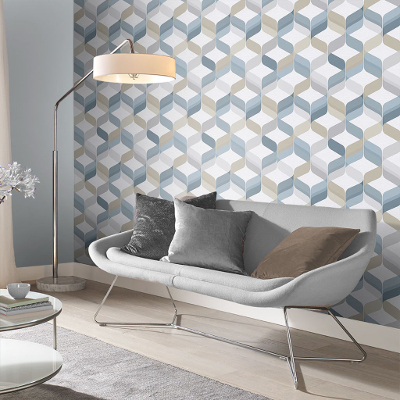 You can upcycle tatty vintage furniture with retro geometric papers or paper the ceiling instead of a feature wall. You can even wallpaper panelled doors or windowsills, creating an incredible visual effect. 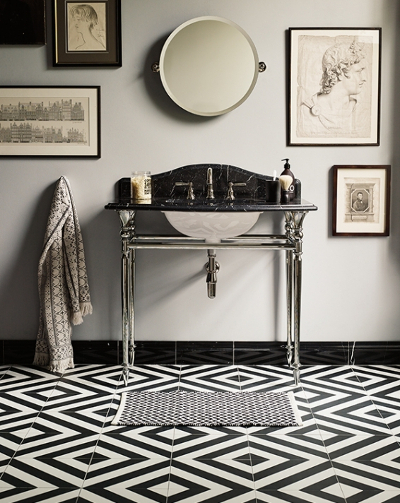 Geometric designs lend themselves really well to tiles, and the effect on floors and walls can be quite arresting. Tiling has been popular since the Victorian era, so it poses a great opportunity to embrace retro patterns in the home. 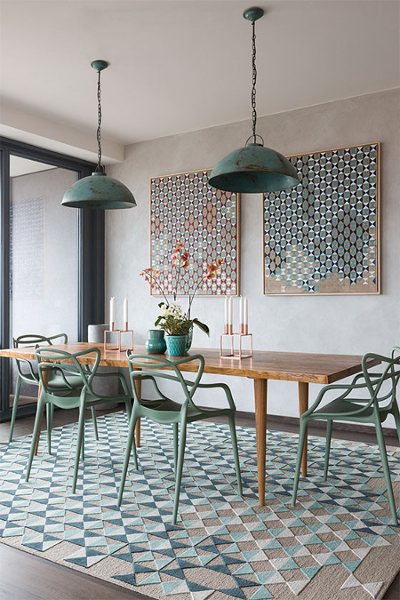 Floor tiles are particularly popular at the moment because they allow you to keep walls neutral but still enjoy an interesting splash of pattern. Tessellation provides instant sophistication and looks great in all areas of the home but particularly bathrooms. Black and white chequered floor titles – popular in the 1940’s – is a traditional approach that remains popular today. You don’t need to make big design changes to enjoy any trend. Textiles can be a quick, easy and affordable way to try a new look or refresh a space. I particularly love geometric rugs for brightening wood floors and adding instant cool to any space. Cushions and curtains also make great canvases for your favourite geometric pattern. Choosing colours and patterns that already match your current interior scheme will prevent any additional work or expense.